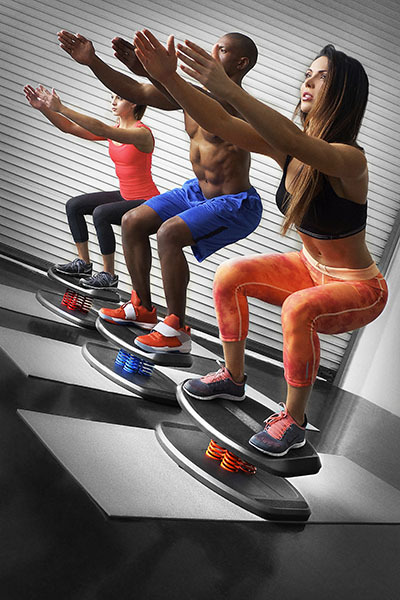 StrongBoard Balance boards are the premier piece of balance training equipment. They are highly portable and perfect for all ages and fitness levels. 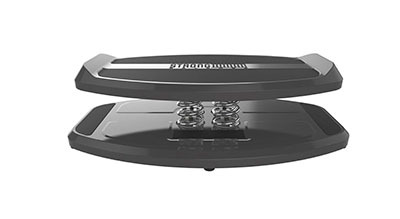 StrongBoard Balance is today's premier balance board. Perfect for all ages and fitness levels, it is portable and electricity-free. It employs patented multi-spring technology which promises users will never find a point of stabilization. Compressing under any weight bearing load, including the human body, StrongBoard's springs are both reactive and dynamic. Simply standing on StrongBoard requires total core engagement. Unlike other balance devices on the market, StrongBoard Balance offers a flat, rigid platform, and it's perfect for standing on one foot or two, planking on one hand or two, and v-sit exercises, allowing individuals to train using their own body weight. StrongBoard is easy and safe to get on and off, and its flat platform protects joints and surrounding ligaments from unnatural supination or strain, allowing the user to mimic real-life movements in all positions. StrongBoard Balance weighs 15 pounds and may also be used as a weight for bicep, tricep, chest and abdominal exercises. In addition to the muscular and skeletal benefits, use of StrongBoard requires the muscles to communicate with the brain, effectively opening, healing, restoring and strengthening delicate neural pathways. The biomechanics of spring technology coupled with the rigid platform require users to find their true center of gravity, allowing these neural pathways to be created or restored without fragmentation. StrongBoard delivers profound results to all levels of fitness enthusiasts, creating desired changes in how users look and feel, as well as improvement in balance, core strength, agility and posture. All StrongHold Fitness products are proudly made in America. This StrongBoard has a Blue Spring. Dimensions: 25" x 10" x 15"
StrongBoard Balance is today's premier balance board. Perfect for all ages and fitness levels, it is portable and electricity-free. 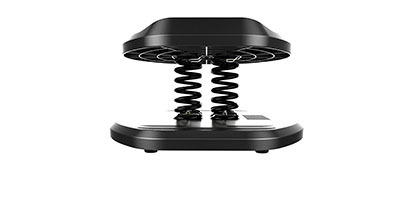 It employs patented multi-spring technology which promises users will never find a point of stabilization. Compressing under any weight bearing load, including the human body, StrongBoard's springs are both reactive and dynamic. Simply standing on StrongBoard requires total core engagement. 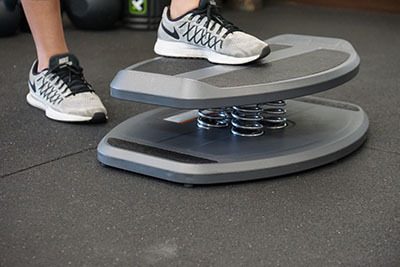 Unlike other balance devices on the market, StrongBoard Balance offers a flat, rigid platform, and it's perfect for standing on one foot or two, planking on one hand or two, and v-sit exercises, allowing individuals to train using their own body weight. StrongBoard is easy and safe to get on and off, and its flat platform protects joints and surrounding ligaments from unnatural supination or strain, allowing the user to mimic real-life movements in all positions. StrongBoard Balance weighs 15 pounds and may also be used as a weight for bicep, tricep, chest and abdominal exercises. In addition to the muscular and skeletal benefits, use of StrongBoard requires the muscles to communicate with the brain, effectively opening, healing, restoring and strengthening delicate neural pathways. The biomechanics of spring technology coupled with the rigid platform require users to find their true center of gravity, allowing these neural pathways to be created or restored without fragmentation. StrongBoard delivers profound results to all levels of fitness enthusiasts, creating desired changes in how users look and feel, as well as improvement in balance, core strength, agility and posture. All StrongHold Fitness products are proudly made in America. This StrongBoard has a Black Spring. 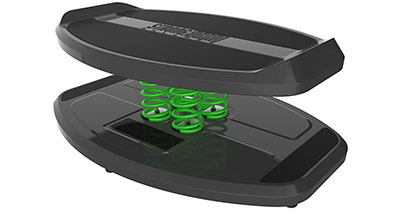 StrongBoard Balance is today's premier balance board. Perfect for all ages and fitness levels, it is portable and electricity-free. 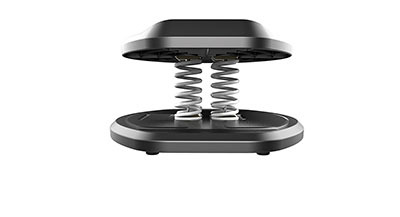 It employs patented multi-spring technology which promises users will never find a point of stabilization. Compressing under any weight bearing load, including the human body, StrongBoard's springs are both reactive and dynamic. Simply standing on StrongBoard requires total core engagement. Unlike other balance devices on the market, StrongBoard Balance offers a flat, rigid platform, and it's perfect for standing on one foot or two, planking on one hand or two, and v-sit exercises, allowing individuals to train using their own body weight. StrongBoard is easy and safe to get on and off, and its flat platform protects joints and surrounding ligaments from unnatural supination or strain, allowing the user to mimic real-life movements in all positions. StrongBoard Balance weighs 15 pounds and may also be used as a weight for bicep, tricep, chest and abdominal exercises. In addition to the muscular and skeletal benefits, use of StrongBoard requires the muscles to communicate with the brain, effectively opening, healing, restoring and strengthening delicate neural pathways. The biomechanics of spring technology coupled with the rigid platform require users to find their true center of gravity, allowing these neural pathways to be created or restored without fragmentation. StrongBoard delivers profound results to all levels of fitness enthusiasts, creating desired changes in how users look and feel, as well as improvement in balance, core strength, agility and posture. All StrongHold Fitness products are proudly made in America. This StrongBoard has a Orange Spring. 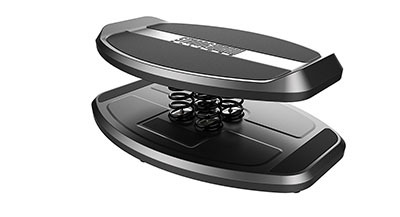 StrongBoard Balance is today's premier balance board. Perfect for all ages and fitness levels, it is portable and electricity-free. It employs patented multi-spring technology which promises users will never find a point of stabilization. Compressing under any weight bearing load, including the human body, StrongBoard's springs are both reactive and dynamic. Simply standing on StrongBoard requires total core engagement. 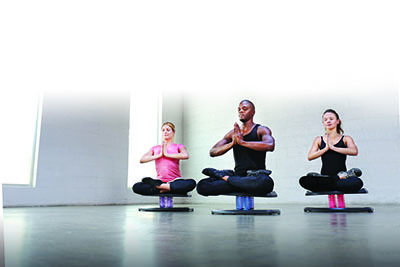 Unlike other balance devices on the market, StrongBoard Balance offers a flat, rigid platform, and it's perfect for standing on one foot or two, planking on one hand or two, and v-sit exercises, allowing individuals to train using their own body weight. StrongBoard is easy and safe to get on and off, and its flat platform protects joints and surrounding ligaments from unnatural supination or strain, allowing the user to mimic real-life movements in all positions. StrongBoard Balance weighs 15 pounds and may also be used as a weight for bicep, tricep, chest and abdominal exercises. In addition to the muscular and skeletal benefits, use of StrongBoard requires the muscles to communicate with the brain, effectively opening, healing, restoring and strengthening delicate neural pathways. The biomechanics of spring technology coupled with the rigid platform require users to find their true center of gravity, allowing these neural pathways to be created or restored without fragmentation. StrongBoard delivers profound results to all levels of fitness enthusiasts, creating desired changes in how users look and feel, as well as improvement in balance, core strength, agility and posture. All StrongHold Fitness products are proudly made in America. This StrongBoard has a Red Spring. StrongBoard Balance is today's premier balance board. Perfect for all ages and fitness levels, it is portable and electricity-free. It employs patented multi-spring technology which promises users will never find a point of stabilization. Compressing under any weight bearing load, including the human body, StrongBoard's springs are both reactive and dynamic. Simply standing on StrongBoard requires total core engagement. Unlike other balance devices on the market, StrongBoard Balance offers a flat, rigid platform, and it's perfect for standing on one foot or two, planking on one hand or two, and v-sit exercises, allowing individuals to train using their own body weight. StrongBoard is easy and safe to get on and off, and its flat platform protects joints and surrounding ligaments from unnatural supination or strain, allowing the user to mimic real-life movements in all positions. StrongBoard Balance weighs 15 pounds and may also be used as a weight for bicep, tricep, chest and abdominal exercises. In addition to the muscular and skeletal benefits, use of StrongBoard requires the muscles to communicate with the brain, effectively opening, healing, restoring and strengthening delicate neural pathways. The biomechanics of spring technology coupled with the rigid platform require users to find their true center of gravity, allowing these neural pathways to be created or restored without fragmentation. StrongBoard delivers profound results to all levels of fitness enthusiasts, creating desired changes in how users look and feel, as well as improvement in balance, core strength, agility and posture. All StrongHold Fitness products are proudly made in America. This StrongBoard has a White Spring. StrongBoard Balance is today's premier balance board. Perfect for all ages and fitness levels, it is portable and electricity-free. It employs patented multi-spring technology which promises users will never find a point of stabilization. 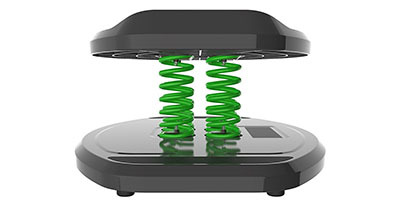 Compressing under any weight bearing load, including the human body, StrongBoard's springs are both reactive and dynamic. Simply standing on StrongBoard requires total core engagement. Unlike other balance devices on the market, StrongBoard Balance offers a flat, rigid platform, and it's perfect for standing on one foot or two, planking on one hand or two, and v-sit exercises, allowing individuals to train using their own body weight. StrongBoard is easy and safe to get on and off, and its flat platform protects joints and surrounding ligaments from unnatural supination or strain, allowing the user to mimic real-life movements in all positions. StrongBoard Balance weighs 15 pounds and may also be used as a weight for bicep, tricep, chest and abdominal exercises. In addition to the muscular and skeletal benefits, use of StrongBoard requires the muscles to communicate with the brain, effectively opening, healing, restoring and strengthening delicate neural pathways. The biomechanics of spring technology coupled with the rigid platform require users to find their true center of gravity, allowing these neural pathways to be created or restored without fragmentation. StrongBoard delivers profound results to all levels of fitness enthusiasts, creating desired changes in how users look and feel, as well as improvement in balance, core strength, agility and posture. All StrongHold Fitness products are proudly made in America. This StrongBoard has a Yellow Spring. 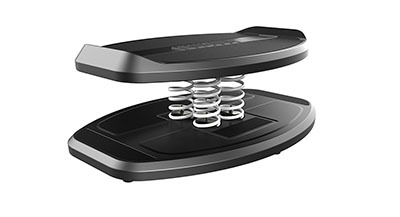 StrongBoard Balance is today's premier balance board. Perfect for all ages and fitness levels, it is portable and electricity-free. It employs patented multi-spring technology which promises users will never find a point of stabilization. 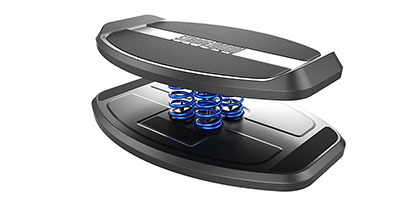 Compressing under any weight bearing load, including the human body, StrongBoard's springs are both reactive and dynamic. Simply standing on StrongBoard requires total core engagement. Unlike other balance devices on the market, StrongBoard Balance offers a flat, rigid platform, and it's perfect for standing on one foot or two, planking on one hand or two, and v-sit exercises, allowing individuals to train using their own body weight. StrongBoard is easy and safe to get on and off, and its flat platform protects joints and surrounding ligaments from unnatural supination or strain, allowing the user to mimic real-life movements in all positions. StrongBoard Balance weighs 15 pounds and may also be used as a weight for bicep, tricep, chest and abdominal exercises. In addition to the muscular and skeletal benefits, use of StrongBoard requires the muscles to communicate with the brain, effectively opening, healing, restoring and strengthening delicate neural pathways. The biomechanics of spring technology coupled with the rigid platform require users to find their true center of gravity, allowing these neural pathways to be created or restored without fragmentation. StrongBoard delivers profound results to all levels of fitness enthusiasts, creating desired changes in how users look and feel, as well as improvement in balance, core strength, agility and posture. All StrongHold Fitness products are proudly made in America. This StrongBoard has a Pink Spring. 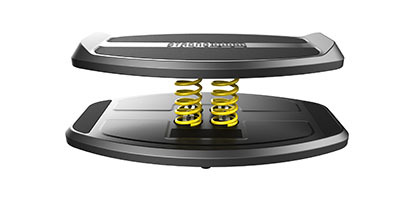 StrongBoard Balance is today's premier balance board. Perfect for all ages and fitness levels, it is portable and electricity-free. It employs patented multi-spring technology which promises users will never find a point of stabilization. Compressing under any weight bearing load, including the human body, StrongBoard's springs are both reactive and dynamic. Simply standing on StrongBoard requires total core engagement. Unlike other balance devices on the market, StrongBoard Balance offers a flat, rigid platform, and it's perfect for standing on one foot or two, planking on one hand or two, and v-sit exercises, allowing individuals to train using their own body weight. StrongBoard is easy and safe to get on and off, and its flat platform protects joints and surrounding ligaments from unnatural supination or strain, allowing the user to mimic real-life movements in all positions. StrongBoard Balance weighs 15 pounds and may also be used as a weight for bicep, tricep, chest and abdominal exercises. In addition to the muscular and skeletal benefits, use of StrongBoard requires the muscles to communicate with the brain, effectively opening, healing, restoring and strengthening delicate neural pathways. The biomechanics of spring technology coupled with the rigid platform require users to find their true center of gravity, allowing these neural pathways to be created or restored without fragmentation. StrongBoard delivers profound results to all levels of fitness enthusiasts, creating desired changes in how users look and feel, as well as improvement in balance, core strength, agility and posture. All StrongHold Fitness products are proudly made in America. This StrongBoard has a Purple Spring. 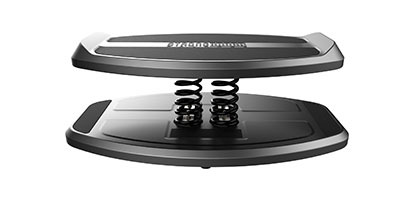 StrongBoard Balance is today's premier balance board. Perfect for all ages and fitness levels, it is portable and electricity-free. It employs patented multi-spring technology which promises users will never find a point of stabilization. Compressing under any weight bearing load, including the human body, StrongBoard's springs are both reactive and dynamic. Simply standing on StrongBoard requires total core engagement. Unlike other balance devices on the market, StrongBoard Balance offers a flat, rigid platform, and it's perfect for standing on one foot or two, planking on one hand or two, and v-sit exercises, allowing individuals to train using their own body weight. StrongBoard is easy and safe to get on and off, and its flat platform protects joints and surrounding ligaments from unnatural supination or strain, allowing the user to mimic real-life movements in all positions. StrongBoard Balance weighs 15 pounds and may also be used as a weight for bicep, tricep, chest and abdominal exercises. In addition to the muscular and skeletal benefits, use of StrongBoard requires the muscles to communicate with the brain, effectively opening, healing, restoring and strengthening delicate neural pathways. The biomechanics of spring technology coupled with the rigid platform require users to find their true center of gravity, allowing these neural pathways to be created or restored without fragmentation. StrongBoard delivers profound results to all levels of fitness enthusiasts, creating desired changes in how users look and feel, as well as improvement in balance, core strength, agility and posture. All StrongHold Fitness products are proudly made in America. This StrongBoard has a Green Spring. 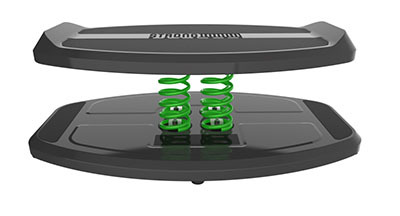 StrongBoard MINI is a state of the art balance board which employs multi-spring technology and offers a full range of motion. 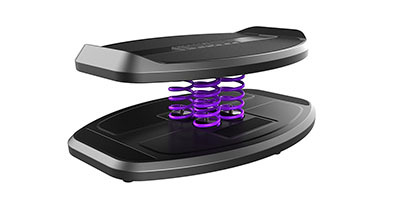 The springs compress under applied weight resulting in an instable surface that provides users with a range of balance challenges and neurological stimulation. Its springs are only 4" tall, making it less reactive and closer to the ground than it's fitness counterpart, StrongBoard Balance. StrongBoard MINI is perfect for physical therapists, at-risk or more sedentary seniors, anyone living with a motor skill or neurological disorder such as Parkinson's Disease, Cerebral Palsy or Ataxia, anyone on the Autism Spectrum, persons working with ADHD, recovering from stroke, or rehabilitating an injury, StrongBoard MINI is the go-to tool for gains in treatment and healing. It is also an excellent alternative physical therapy aid for those individuals who require creative ways to remain strong after experiencing an above-the-elbow (AE) trans humoral, above-the-knee (AK) trans femoral surgery or amelia. StrongBoard Balance has also been utilized by individuals who look to the American Orthotic and Prosthetic Association (AOPA) for innovation and advancement in strength training. Dimensions: 25" x 8" x 15"